Firefighters opposed to the closure of London fire stations have protested outside the former Clerkenwell Station, formerly the capital's oldest operational station. Clerkenwell, which was opened in 1872, was one of 10 stations closed this week [9 Jan] as part of efficiency savings which London Fire Brigade say will save £28.8m. LFB argue that changes, including the loss of 552 firefighters, were "inevitable" but the service would not be affected. 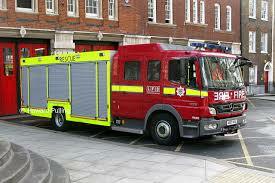 But the Fire Brigades Union suggest that the cuts will compromise public safety. FBU member Greg Edwards addressed the crowd outside after he left the fire station and lit a candle in honour of its 140-year history. He said: "I just feel that it's a disgrace that they can shut a fire station so close to the City, the third busiest in London." Emily Thornberry, Labour MP for Islington South and Finsbury, agrees that the fire station was essential for the densely populated area. "People here are furious," she added. "If there were to be a terrorist outrage in the City of London, what is going to happen? We don't want to be in a position of 'I told you so'." However, LFB's research suggests that the cuts which have taken place so far, which also include reducing the number of fire engines by 14, will not affect the service it provides because the number of fires has fallen by 50% over the last 10 years. James Cleverly, chairman of the London Fire and Emergency Planning Authority said: "If you dial 999 and need a fire engine, we still aim to have one with you within six minutes and a second, if needed, within eight. "The brigade is faced with significant budget cuts, which mean that changes to the service are inevitable, and we are able to make those changes without compulsory redundancies." The other fire stations which closed were Belsize, Bow, Downham, Kingsland, Knightsbridge, Silvertown, Southwark, Westminster and Woolwich.